On Thursday, Dec. 15, Colin OâBrady will talk about his record-setting adventure to conquer the Seven Summits and both poles â the Explorers Grand Slam. What: “Beyond 7/2: Breaking the Explorers Grand Slam World Record,” with Colin O’Brady. When: Thursday, Dec. 15; 5:30 p.m. reception, 6 p.m. program. Where: Donovan Pavilion, 1600 South Frontage Road W, Vail. More information: Even though this is a free event, space is limited and preregistration is recommended. Visit www.vailwymposium.org or call 970-476-0954 to register. • Only 51 mountaineers have ever finished the Explorers Grand Slam. • The sun only rises once per year on the South Pole. • Colin O’Brady took approximately 56,000 steps to reach the summit of Mount Everest at 29,029 feet. • O’Brady had to trek 69 miles to reach the last degree of latitude at the North Pole. • Carstensz is the most technical summit of the Seven Summits and requires 5.5 and above-rated rock climbing. • Average temperature during the climbing season on Mount Vinson is negative 20 degrees. in January, mountaineer Colin O’Brady set out to break the world record for the Explorers Grand Slam — climbing the tallest mountain on each continent and trekking to the last degree of latitude on the North and South poles. 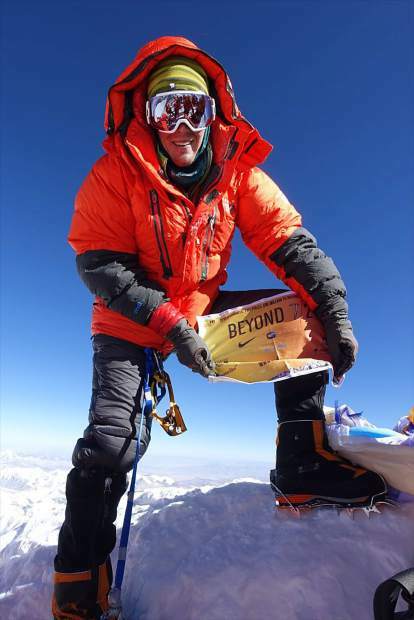 O’Brady summited the last two peaks, Mount Everest on May 19 and Denali on May 27, in a crescendo of climbing to shatter the world record by nearly two months. He finished the entire quest in only 139 days. Today, O’Brady will talk about his record-setting adventure at the Donovan Pavilion in Vail as part of the Vail Symposium’s Unlimited Adventure series, presented in partnership with the Vail Public Library. The event begins with a reception at 5:30 p.m., and O’Brady’s talk will begin at 6 p.m. The event is free, with a $10 suggest donation. It was an achievement that astounded the mountaineering community world over, but also one of great personal significance for O’Brady who, in 2008, suffered an accident that severely burned 25 percent of his body, primarily his legs and feet. To further increase the significance of his record, O’Brady managed to raise nearly $1 million to fight childhood obesity for a charity he started called Beyond 7/2, meaning beyond the seven summits and two poles. O’Brady’s record has been featured in People magazine, Men’s Journal, Outside, Washington Post, USA Today, VICE, CBS News, Parade and a variety of climbing publications.